I am on a mission! I want to inspire all of my readers to go out to the garden every week and pick flowers. I have been doing it for decades and it brings so much beauty to the inside of my house, especially now that the days are getting shorter. We need this in our lives! This week’s Garden Bouquet of the Week is brought to you by white Montauk daisies (Nipponanthemum nipponicum), perennial sunflowers (Helianthus salicifolius ‘First Light’), Aster laevis ‘Bluebird’, and the delicate foliage of Amsonia hubrechtii. The picture above is a scene from the border surrounding my raised veggie beds and it is what inspired this week’s flower arrangement. The hydrangea in the background (Hydrangea serrata ‘Preziosa’) had a great year and will provide me with lots of dried flowers for my autumn wreath. 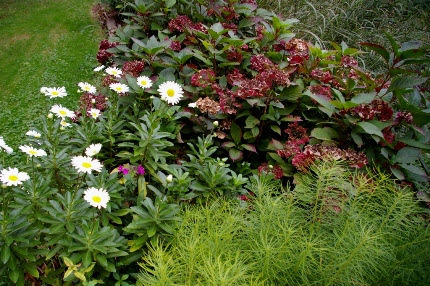 My Montauk daisies are very prolific. There’s nothing more cheerful than a vase filled with giant white daisies at this time of year!